This item contains an article on the Indians of the United States written by Carl Julius Adolph Hunnius. Known as Ado to his friends and colleagues, Hunnius was a Civil War veteran, Indian Wars veteran, artist, writer, and long time resident of Kansas. The article, printed entirely in German, contains information compiled by Hunnius on the Native American tribes in the United States. 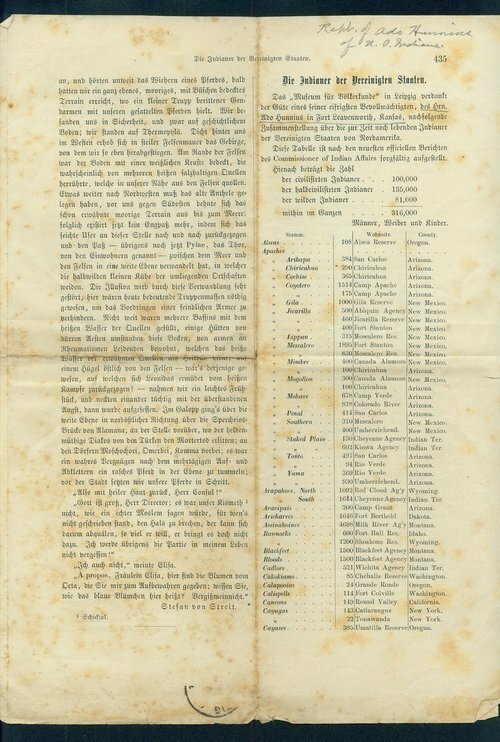 Details include the branch of the tribe (Stamm), place of residence (Wohnsitz), county, and the total number of men, women and children (Manner, Weiber, und Kinder) for each tribe. The information provided in the article was taken from the offical reports of the Commissioner of Indian Affairs. The article also mentions that there were a total of 100,000 civilized Indians, 135,000 half-civilized Indians, and 81,000 "Wild" Indians. Call Number: MS Collection 397, Carl Julius Adolph Hunnius papers, 1861-1926, Box: 2, Folder: Articlesâ€¦in German - Die Indianer der Vereinigten Staaten.